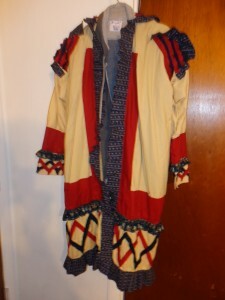 I recently finished making a Seminole coat for the Florida Museum of History in Tallahassee. It is a reproduction of an actual coat that exists in the collection of the Florida Museum of Natural History in Gainesville. Although it was once on display, not anymore due to deterioration over the past 175 years. So to better understand what I was recreating, the museum arranged for me to have one of their curators do a white glove inspection of the original. Notice that knee ties / beaded garters were placed on the coat wrists. This is an interesting coat because it was different from almost any rules of coat making that we have held fast to previously. The edges are hemmed instead of loose. 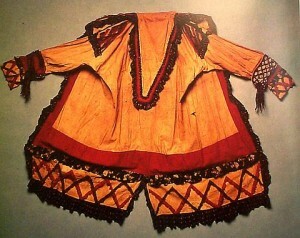 The applique is fringed on the side. 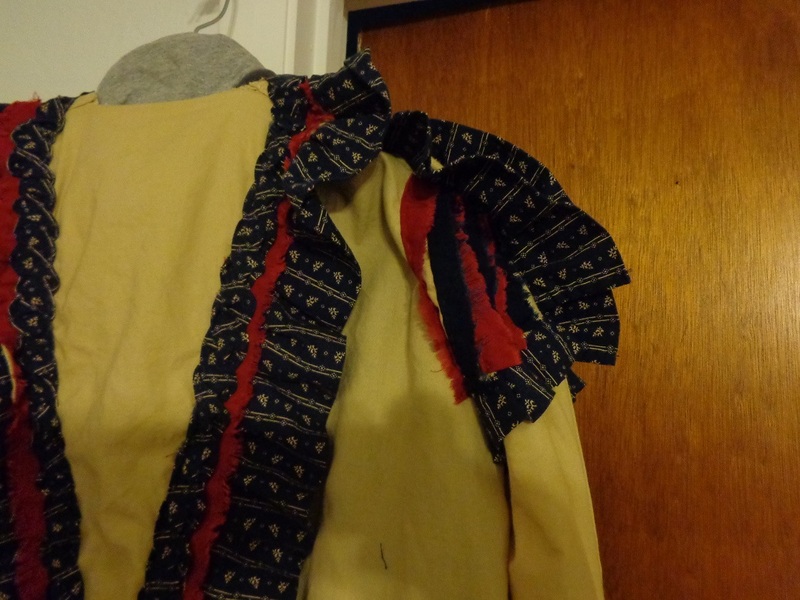 The applique looks red and brown, but since it used blue thread, I am confident that it was originally indigo blue but oxidized over the years, which we have seen happen to Civil War uniforms. The ruffles and the applique on the shoulders have the appearance of trying to mimic military officer epaulets. 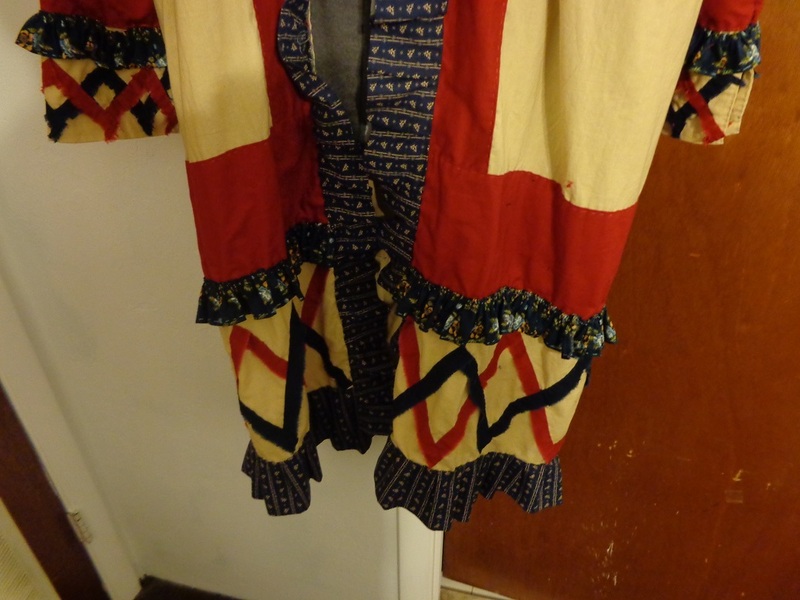 And the braided applique on the narrow cape reminds me of military braid. It also reminds me of ric rac. At first I thought this was a modified coat, or adjusted as the person grew, but not so. 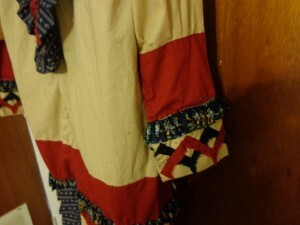 The basic coat was made, then all the decoration, ruffles, applique, and braiding were sewn on top. It was not sewn into the garment as it was made, but sewn on top. This makes sense if the garment is being made while on the move, so you don’t have a lot of loose material pieces to sew together. For the ruffles I found prints that were very similar to the original print. But the main basic material has a leaf block stamp on it, that I have not found a similar pattern searching reproduction fabrics. So the museum may attempt to stamp that print on it, but that is something that I never tried to do. And the entire coat is hand sewn. 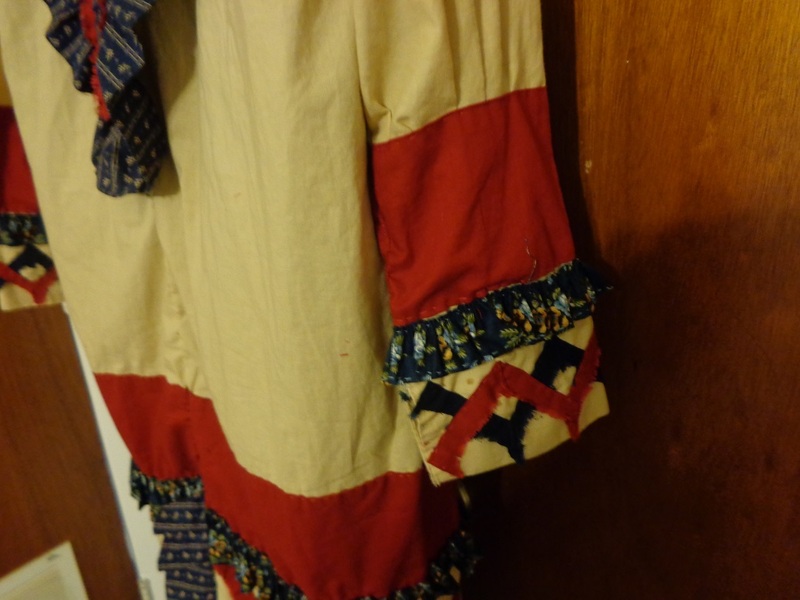 Simple running stitch, whip stitch, and French seams, but whoever made the original was an expert seamstress. Below: Final, finished reproduction complete. Now, how the museum came into possession of the coat, and the history of it, was another interesting research project that I did concurrently. I worked on the coat and sewing in the evenings and weekends. During my lunch break, I went down to the library to do research. The story behind the coat, was that it was in the possession of Private William Goulding, Company F, 2d Dragoon Regiment. Being a personal item of a private soldier is extremely rare, and unique. 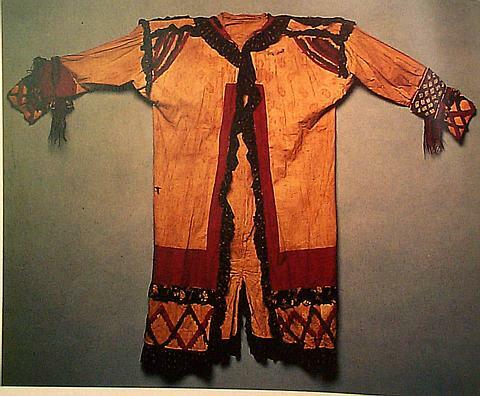 Why did a Private soldier have a Seminole coat as a souvenir? Goulding died of dysentery at Cedar Key in December 1841, and never left Florida. His surviving family came in possession of his items, and in the 1970s, it went on auction in Vancouver. It was purchased by a museum, which did a collection swap with the museum in Gainesville, which is not uncommon for museums to do. The story was that this coat was originally from a Creek or Seminole named “Black Beaver.” I have not found reference to this “Black Beaver,” but that does not mean he didn’t exist. I must also keep in mind, is that this information is from third-hand sources and highly suspect. But the coat definitely has the appearance as Seminole, with characteristics that we see in the coats of the same era in the collection of the Museum fur Volkskunde, in Berlin. So, the Black Beaver story is highly suspect. Instead, let us look where Pvt. Goulding’s company was, and maybe we can determine where he may have picked it up? We may not have a month-to-month record of Goulding, but we do have a monthly description of his company, and the officers who commanded it from the post returns. I do not know when Goulding enlisted, but the regiment had a large turnover in September 1839, when the three-year enlistment ended with most all the soldiers in the regiment. Most did not reenlist. There is a good description of the 2d Dragoon Regiment from Private Bartholomew Lynch’s journal that was published as a master’s thesis by a student at FSU in 1965, called, “The Squaw Kissing War.” Pvt. Lynch was in the 2d Dragoons, Company H, and was at some of the same posts as Pvt. Goulding, but maybe not at the same time. He describes many of the officers in the regiment, including those who served as officers of Goulding’s company. Most all the officers of the regiment are characterized as incompetent and disinterested in the life of their subordinate soldiers. Lynch describes the treatment of the soldiers as worse than slaves. Thievery, drunkenness, and brutality were commonplace, and that was from the officers. The common soldiers suffered from these abuses, and there was no redress or justice for these wrongs. So to keep it short, morale was low and life was difficult in the regiment. Not something that would cause the soldiers to keep any souvenirs other than mental scars of the abuse if they survived. Lynch says, "Why sue the devil if the court is held in hell?" Goulding’s company had a constant rotation of officers as they were given detached service elsewhere, or that they resigned or were kicked out of the Army. His company commander, Capt. Townshend Dade (a distant relative of Maj. Francis Dade) was cashiered out of the Army for unspecified behavior in February 1840, and at the same time, his lieutenant, 1st Lt. William Hardia, was also kicked out for being constantly drunk. Dade died a year later, and Hardia survived the next two years as a school teacher before he died of drunkenness as well. Following, the company was commanded by Capt. Nathaniel or Nathan Hunter, and he was actually pretty good. But his successors were more of the same drunken or incompetent officers as Dade. The company was stationed at Fort Shannon at Palatka, St. Augustine, Fort Hunter on the St. Johns near Palatka, Fort Reid in what is now Sanford, Fort Heileman at Black Creek, and later Fort Brooke at Tampa Bay. At times, Lt.Col. William Harney was also there, to lead the regiment but maybe also to maintain discipline. But, I find no record of Company F, from November 1840 to January 1841. That means they are most likely on the move. And much of the time, the company would be split up doing detached service in the territory. So before the company disappears in November 1840, they are with Col. Harney at Ft. Reid. Then, Harney goes on his famous Everglades campaign where he finds the Spanish Indian leader Chekiaka, who is killed and hanged by Harney. On this expedition is Capt. Hunter and Hunter’s subordinate officer, so it is highly likely that the men of Co. F are also along. During this campaign, it is one of the first special forces operations, where the soldiers dress in Seminole clothing and travel in dugout canoes, to be able to sneak up on the Indians. 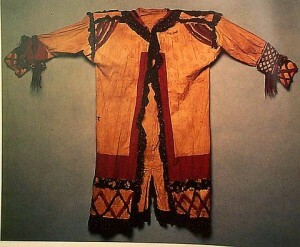 I propose that this original Seminole coat was a souvenir from that mission, and would suggest that maybe Pvt. Goulding wore this coat on the campaign. That is why he had it as a souvenir. The following August, Goulding shows up on the hospital list, and never recovers. In December he dies of dysentery, never to leave Florida. There is probably no way to prove conclusively that this coat was used on that Everglades expedition, but I think that if it could be proven, then this is huge! Being able to connect it to this actually event, which was significant, would be amazing. Seeing the movement and actions of Goulding’s company the two years before his death, there are not many other events where he could have obtained the coat. 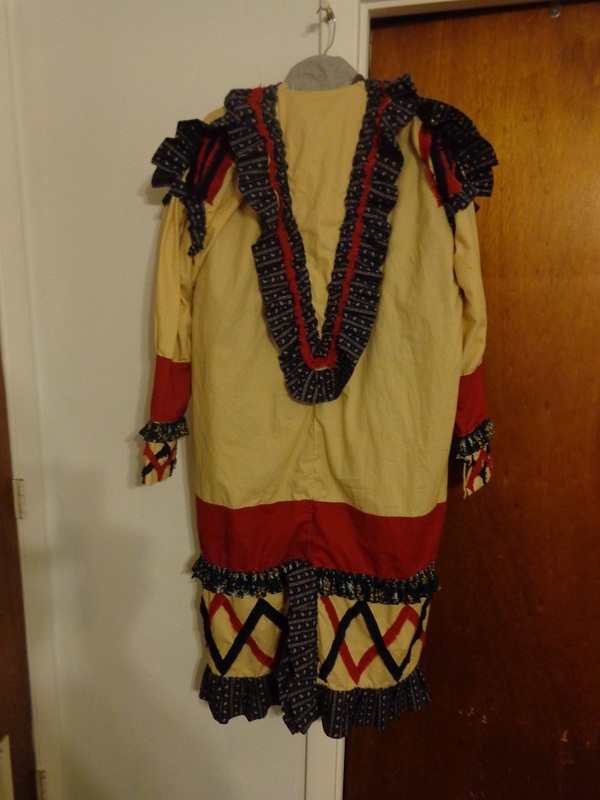 The company was involved in several actions and battles in 1837 and 1838, but I don’t know if Goulding was with the company at that time, and it was not known for private soldiers to take Seminole clothing off the clothes line when they raided camp. Usually seized items would be turned into the quartermaster or burned on the spot. The best explanation to me, is that the coat was worn by him in the Everglades campaign, and afterwards because a curious souvenir. Why could you not use or photos? I have a large number of VHS tapes and photos I took of the collection in 1976 and later in the 1980's and then the 1990s. What has changed?